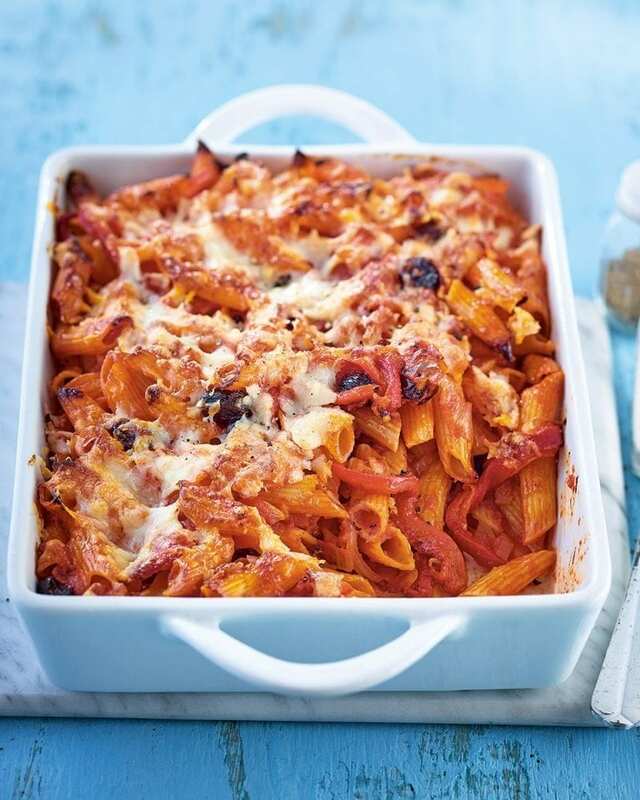 This vegetarian pasta bake uses grilled red peppers for their naturally intense sweetness. Combined with tangy goat’s cheese, fresh spinach and a kick of chilli, this recipe is sure to be a hit with everyone. Heat the oven to 220°C/200°C fan/gas 7. Heat a glug of oil in a large deep sauté or frying pan, add the onions and fry over a medium heat for 5 minutes until starting to soften. Add the garlic and fry for a few more minutes, then add the chilli flakes and pepper strips. Turn up the heat and cook for about a minute, then add the wine. Let the wine bubble vigorously for a couple of minutes, then turn the heat down and add the vinegar, passata, sugar, raisins, thyme and spinach. Season well, then bubble for 10 minutes, stirring occasionally. Taste the sauce and adjust the seasoning if necessary. Stir in the pasta, then pour everything into the baking dish and scatter over the goat’s cheese (see Make Ahead). Bake for 20 minutes until golden and bubbling, leave to stand for 5-10 minutes, then serve. Use fresh peppers if you prefer – you’ll need to cook them with the onions for an extra 15 minutes to soften. Assemble the bake up to 2 days ahead (step 3) and keep covered in the fridge. Add an extra 5-10 minutes to the cooking time to ensure the bake is piping hot throughout.